This is, at best, a curate's egg of a disc. The pluses are the fine playing by violinist Robert McDuffie who really engages with the style and idiom of Mike Mills' Concerto especially. John Adams' three movement Road Movies proves to be an interesting and enjoyable work for violin and piano - again impressively played. And that's about as far as the good news goes. 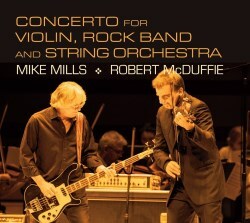 The 'main' work here is the aforementioned Concerto for Violin, Rock Band and String Orchestra by Mike Mills. Mills is best known as being the bassist in R.E.M. and McDuffie was a close friend back in high school. So the link between these two musicians is a genuine enduring friendship not some marriage of convenience dreamt up by a record company's A&R department. The liner quotes McDuffie's enthusiastic support for both Mills in general "... one of the greatest living American composers", and the work in particular. I am afraid I cannot share one jot of his enthusiasm for the work no matter how much I respect its performance here. I am sorry that in the liner notes McDuffie drags out the idea that the violin repertoire is the preserve of music by "dead white European males". That might well be the case but this piece hardly manages to redress the balance and Mills in effect ticks 3 of these boxes if you substitute Caucasian for European. For starters, why bother calling it a concerto - it is not. This is a suite of six pretty much unconnected sections. If that might seem to suggest that I am getting bogged down in semantics remember that the concerto form implies at least a dialogue between soloist and ensemble as well as the sense of material being developed and explored. Here, Mills suffers from the crucial problem that affects most genre-crossing composers - they simply do not have the technical facility to 'develop' their musical material. That does not mean they could not do it - simply that the field in which they work does not require that skill so it remains underdeveloped. It’s a bit like asking a marathon runner to win a sprint - high levels of skill in the related field but ultimately non-transferable. Pretty much every movement starts off with an ear-tickling 4 or 8 bar riff based on very basic harmonic progressions - but what to do then?...... Mills answer is to repeat it, with the solo violin simply playing ever more extended 'variations' on the material. It really is extraordinarily dull and musically unimaginative. I wonder who wrote most of the solo part - the reliance on violinistic 'tricks' - arpeggios, ricochet bowings, chordal effects, broken arpeggios is striking. Before anyone assumes this is just the rantings of someone ideologically opposed to any cross-over between rock and classical let me put that record straight. I spend much of my professional musical career arranging and performing contemporary and classic rock for strings - it can work really well. If you do not believe me - look some of the videos on YouTube-www.youtube.com/watch?v=6xfiHulyrfE or www.youtube.com/watch?v=dgohzEcss8g. Stunningly imaginative arranging, brilliantly played, showing how to 'develop' rock/popular material. Elsewhere hear how stellar players such as Roby Lakatos or Pavel Šporcl approach the classical/rock/jazz divide. Or even violinist Sophie Solomon on her album Poison Sweet Madeira - I have to say I am not a massive fan of that album but I respect what Solomon what sets out to do, blurring the classical/rock divide. Then there is the other way to come at this; the classical side influenced by rock. Michael Daugherty is an obvious post-modern example of this approach. Many of his works are clearly influenced by the idiom and rhythm of rock - so much more wittily and skilfully than here. Less well-known and possibly even more impressive are the works of Australian composer Matthew Hindson - his violin concerto is in a different universe of impressiveness to Mills' slackly-composed piece. Listening to the Hindson, one is also struck by his skill as an orchestrator. Another issue in the Mills work is the lack-lustre writing for the nominal string orchestra. It seems to have no substantial function except as a supporting harmonic background. Hard to blame orchestrator/arranger David Mallamud for this - I assume he was arranging to order but there is little rhyme or reason to the musical wallpaper which constitutes the vast bulk of his string arranging. It is the ever-dull ‘string sustains’ or ‘chugging chords’ that blight the vast bulk of string arranging for pop records to this day. Watch any TV programme which features a band and live strings and for the bulk of the time the players will be trying to make material which consists of 1 bow to a bar look exciting! The final nail in the coffin of the Mills' 'concerto' is its length. If the material has to be repeated please don't keep repeating it. The 4th movement Stardancers' Waltz starts off with a really attractive lilting Country Rock feel..... and then goes on for nearly ten minutes of the same. At about 3:45 Mallamud pulls out of his arranger's hat an unrelated passage of faux-baroquey counterpoint. Elsewhere the orchestral strings are suddenly mixed into the foreground for some swooping effects which in isolation sound rather good but seem to have little structural or musical purpose. Generally the string playing of the MCS Ensemble is adequate without in any way being exceptional. This ensemble is - it appears - a student ensemble drawn from the McDuffie Center for Strings at Mercer University. For students this is not bad playing but I have heard better. There follows the John Adams Road Movies. The liner note see fit to write only about the Concerto as well as providing pretty extensive artist biographies. A shame since this is by some distance the most interesting music on the disc. So apart from the fact it was written in 1995 and is in three movements I can tell you little else. The outer movements take a kind of manic bluegrass minimalist fiddling as their starting point and they enclose a beautifully still and reflective movement called Meditative. Here we can hear McDuffie's real skill as a player and musician - beautifully supported by pianist Elizabeth Pridgen. McDuffie has adapted his playing style, moving away from the edgy rough-hewn playing of the concerto to more 'classically' controlled - the correct choice in either instance. I am not saying this work is a solid gold masterpiece but in the current company it probably is. I have played a lot of minimalist music by most of the best-known composers, from Part to Reich and Adams but oddly not a note by Philip Glass. Experience shows me that knowing this music from the inside increases one's understanding and appreciation of it. However, as a listener alone Glass' music leaves me almost wholly unmoved. Symphony No.3 is written for strings alone but there seems to be no imperative for it to be strings. Glass could have written this as effectively for massed kazoos it seems to me. Movements I & III are steadier, II & IV quicker with a higher rate of harmonic turnover than much minimalist music but to my ear this becomes a weakness not a strength. The very stasis of much minimalism whether harmonically or texturally, produces the effect of time standing still which is at the core of the genre. Because more 'happens' in Glass the paucity of the invention is revealed. The playing of the MCS is again good enough for a student group. But even cursory comparisons with either the Bournemouth SO performance under Marin Alsop on Naxos or the Stuttgart Chamber Orchestra under Dennis Russell Davies (the artists who gave the 1st performance) show the professional orchestras to be far more sophisticated and nuanced ensembles - and both are better recorded too. I am left frustrated by this disc. Hard not to hear the concerto as some vanity project. Why is it that rock composers who have given the world perfect gems in one genre throw themselves lemming like off the cliffs of another? Why the liner deigns not to write a word about composers who - like them or not - are of greater stature in the 'classical/contemporary' genre I do not understand - neither do their works merit a mention on the CD cover. The extended information about everything and everybody except Glass and Adams increases the suspicion that this is some kind of vanity project rather than any proper attempt to bridge the classical/rock divide. Check out Matthew Hindson, check out the superb Quartetto Archimia - leave this disc at the check-out.